Catherine at Design Editor experimented with making oversized black-and-white prints for cheap. She photographed a couple of her vintage cameras, then made 24"x36" engineering prints of them for three bucks at Staples. The best part: you can download her camera images for free and get your own printed up. Cool DIY wall art for your home or office! 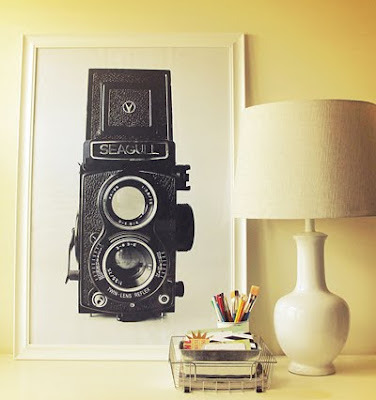 You have read this article decorating / downloads / tutorials with the title Download and print vintage camera posters. You can bookmark this page URL http://jenkrebs.blogspot.com/2012/09/download-and-print-vintage-camera.html. Thanks! No comment for "Download and print vintage camera posters"